What is the European Legends programme? 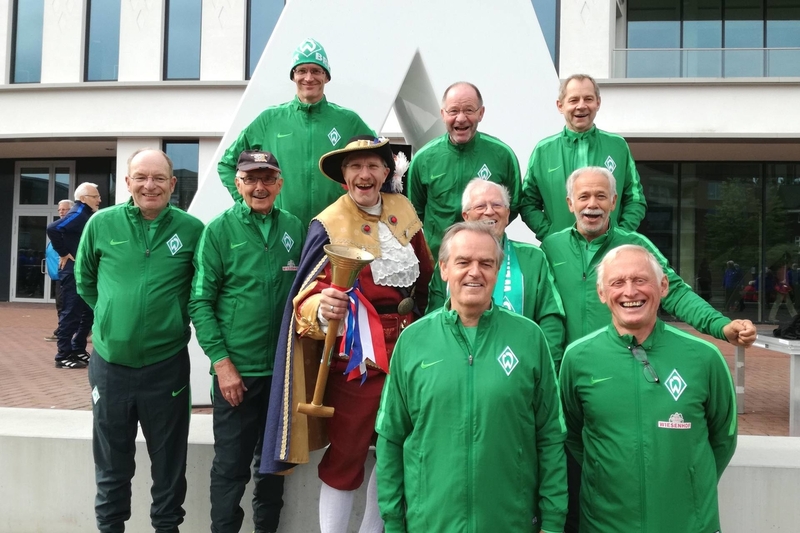 While the professional football team of SV Werder Bremen has to wait until being back on the pitch, Werder’s Walking Football team entered the Almelo City Cup in the Netherlands, from the 7th until the 9th of June. At the tournament, next to Heracles Almelo, overall 31 teams from Belgium, Germany, England and the Netherlands were in attendance. At Werder Bremen, Walking Football has become very successful – a great number of participants of the age above 50 years old are participating in the programme. Walking football is a game of football, where the players walk instead of run. The sport is designed to support people above 50 years old, to get fit or maintain an active lifestyle independently from their age and level of fitness. The programme supports participants to get back into football, if they had previously given up due to age, injury or health reasons. To date the programme has seen many health benefits of the participants including lowering heart rates, blood pressure, weight loss and better mobility. The programme is providing participants opportunities for social interaction which is a unique outcome, which integrates participants back into society by tackling social isolation. The Tournament in Venlo started on Thursday with the inauguration by the major of the city, afterwards, group phase one followed. In the evening, the participants enjoyed music, dancing and a raffle. The following day, the next group phase followed, in which, the Green & Whites took a fabulous stint with three victories over Goldstars Heracles , Grimsby Manners and Beuningse Boys , so that it went to places 17 to 20. If the team were still able to contend with Rood Wit Veldhoven , they had to contend with OH Leuven and could still look forward to a strong 18th place. Particularly noteworthy is the team spirit of the Walking Footballers! The entire SV Werder Team, proudly represented their club and promoted the great sport of Walking Football. Next International Stop for the German team? The EFDN’s Walking Football Festival! The Walking Football team of Werder Bremen is now taking a well-deserved summer break… Before starting the preparations for the EFDN Walking Football Festival 2017 in Arnhem, the Netherlands. The Festival will be held from the 18th September to 20th September 2017 in the great facility of Papendal. At the tournament, 24 Walking Football teams from all across Europe will take part in the Festival. The participating partner Clubs of the European Legends Programme will place 13 teams. For that reason, it can already be confirmed that teams from Portugal, Belgium, England the Netherlands, Germany, Cyprus and Norway will be in attendance. The Walking Football Festival will offer an exciting and not to be missed event programme on and off the pitch. This includes cultural visits, after dinner entertainment and fan zone during the festival.